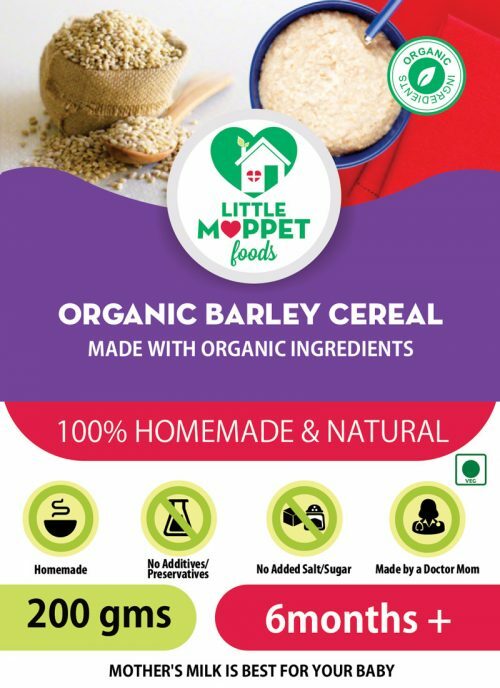 Non-allergenic and healthy organic barley cereal for babies. 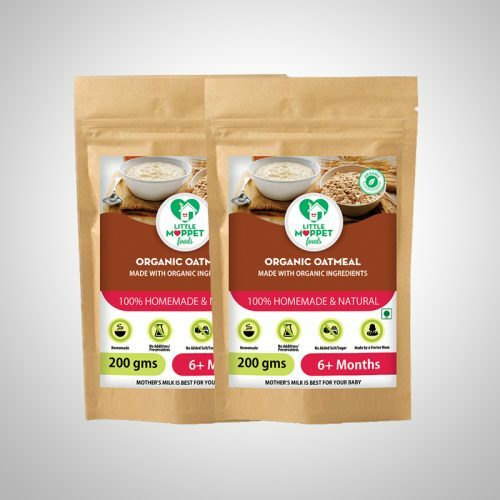 Oats is popular for its various health benefits, both among adults and children. 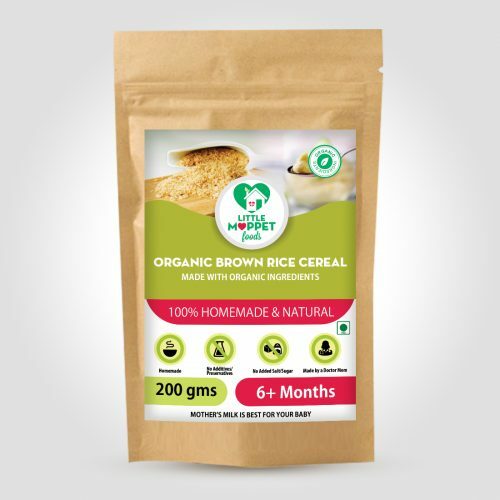 Even young babies can benefit from this super food. 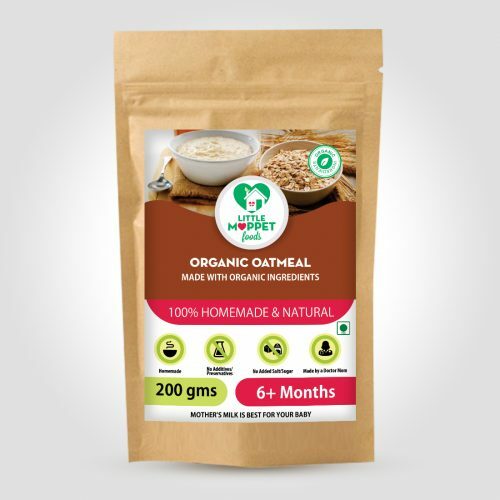 Oats contains more soluble fibre than any other grain and its protein content is equal in quantity to that of soy, meat, milk and eggs. Kerala bananas on the other hand, are full of minerals like potassium, calcium, iron and phosphorous. 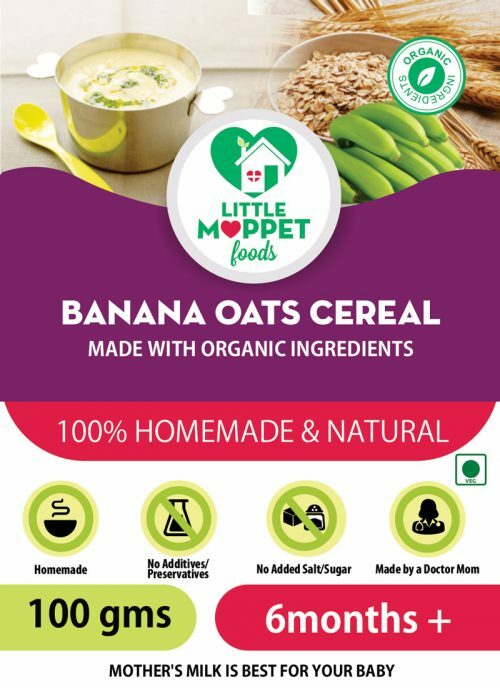 Little Moppet Food’s Banana Oats Cereal combines the natural sweetness of Kerala bananas and the rich nutrients of oats in one easy-to-make baby meal. 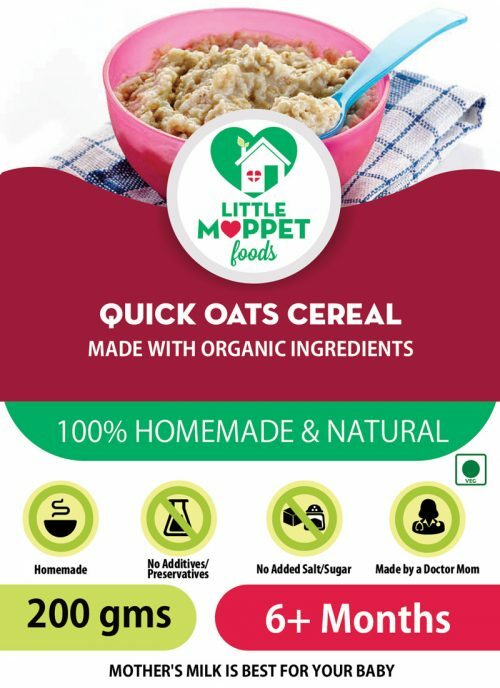 Let baby enjoy her regular oats in a new, yummier format! 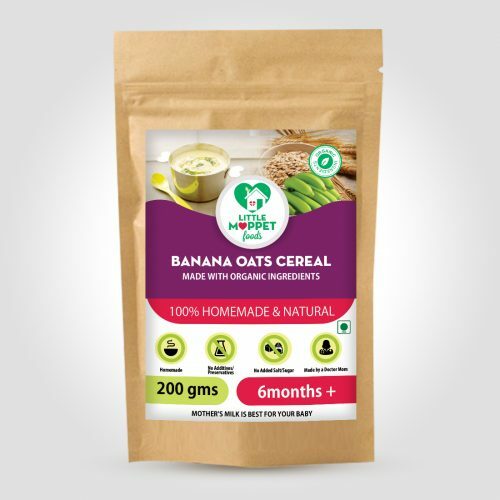 As with all our products, our Banana Oats Cereal is also prepared using the freshest ingredients in the most hygienic conditions by a Doctor mom. 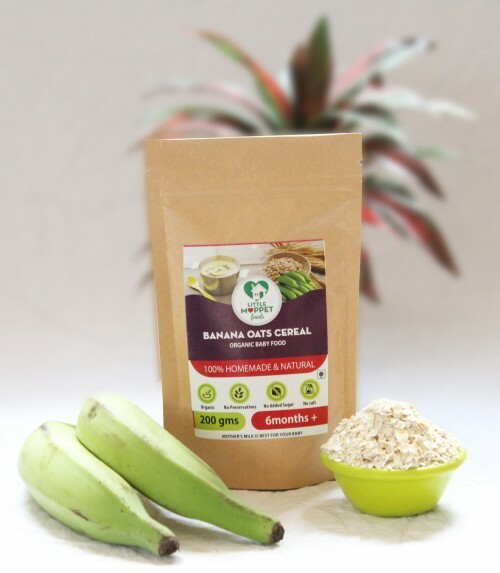 So you needn’t worry about drying and grinding the bananas or the oats, we’ve done it for you! Just place your order, sit back and open the door when the delivery man arrives! 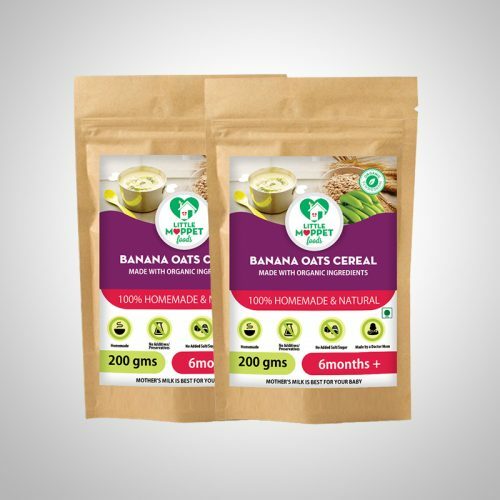 Super Saver pack – 2 Packs of 200 gms of Banana Oats cereal. You save Rs 59.2! Get the benefits of whole grain and fruit in one dish! The first stage of weaning your baby is fairly simple, as most Moms offer a puree of a single fruit or vegetable or a single grain cereal. However, as your baby gets used to these, it’s time to mix things up and get her used to more complex flavors. 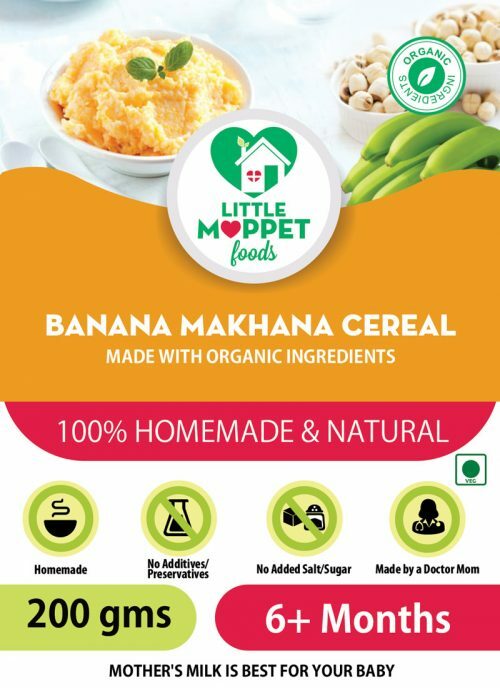 Mixing grains and fruit or veggies also increases the nutritional value, as in Little Moppet Foods’ Banana Wheat Cereal! 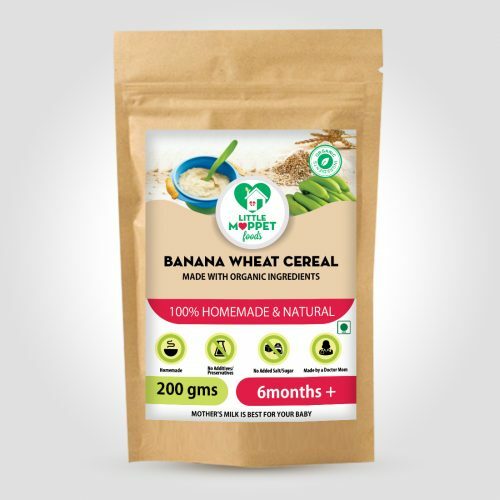 Our Banana Wheat Cereal is an excellent source of carbohydrates, since it includes raw Kerala bananas and wheat – two fiber-rich starchy foods that are ideal for gaining weight. As your baby becomes more mobile and starts crawling, reaching and standing, he needs more energy for his daily activities. 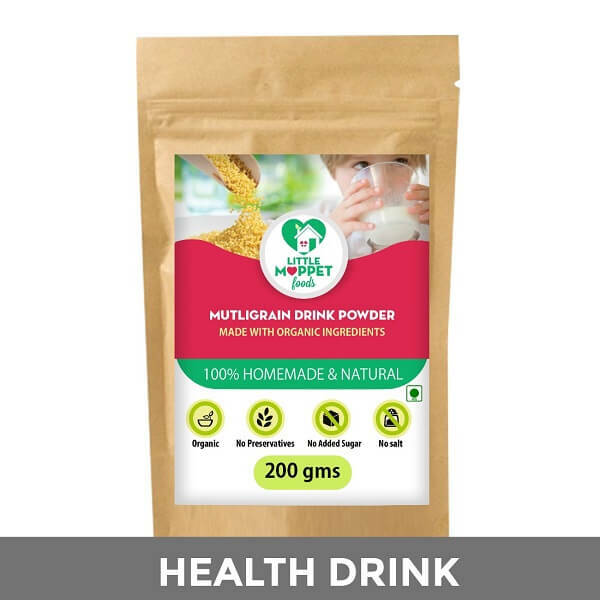 Besides, the high fiber ensures that he doesn’t strain during bowel movements and also succeeds in maintaining health cholesterol and blood sugar levels. 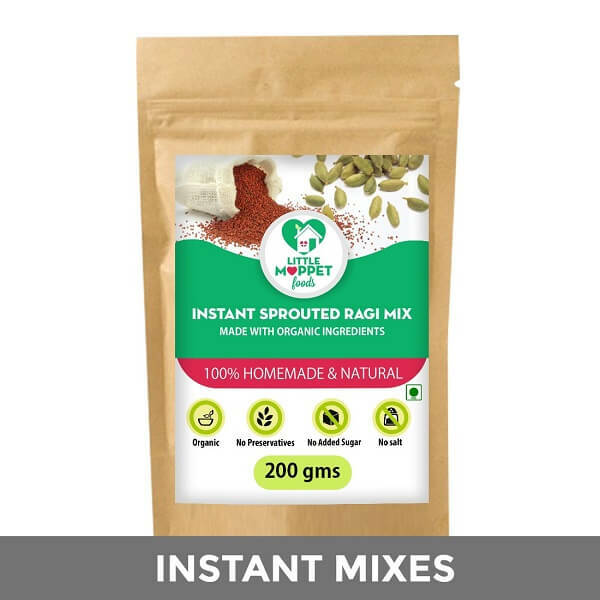 What can be more convenient than a dish that is already pre-mixed in the perfect ratio, so that you don’t have to worry about how much of each ingredient to mix. 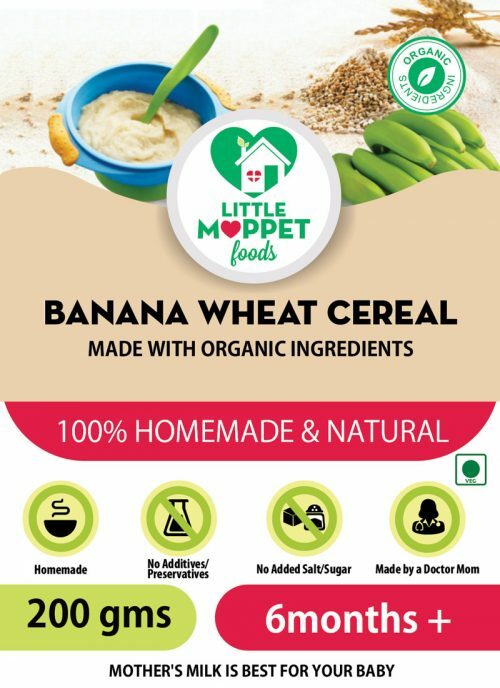 Once you’ve ensured that your baby is not allergic to wheat, Little Moppet Foods’ Banana Wheat Cereal is the ideal next stage baby food. 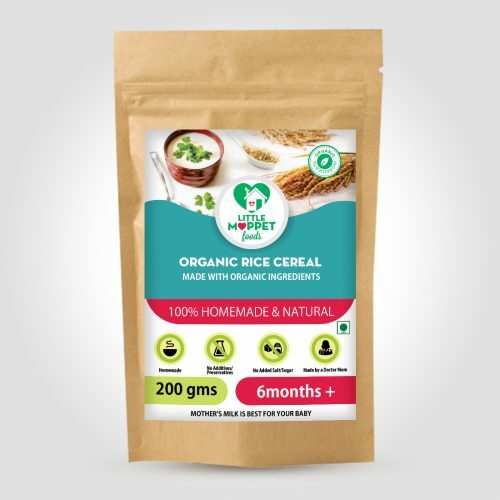 It is made from 100% natural ingredients and flavored with elaichi rather than artificial flavors, so that your baby’s food is free from anything synthetic. 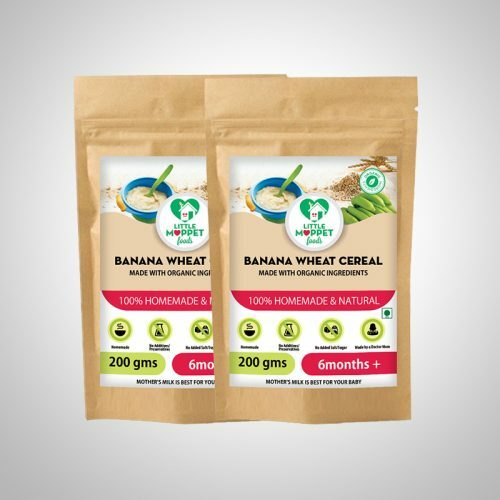 Super Saver pack – 2 Packs of 200 gms of Banana wheat cereal. You save Rs 59.2! 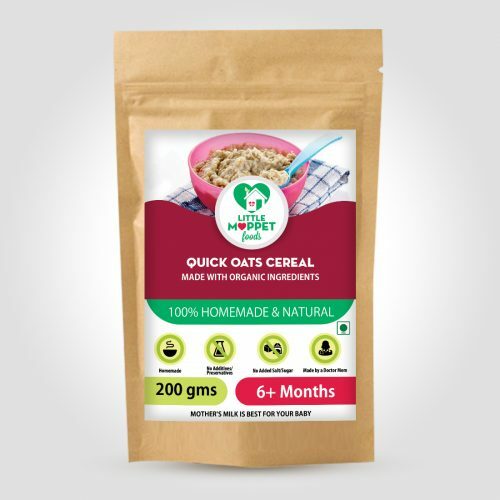 Boost your baby's growth the yummy way! Everyone needs protein, but this important nutrient is much more crucial for babies since they are growing at such a fast rate. Due to this, babies require more protein per body weight than older children. 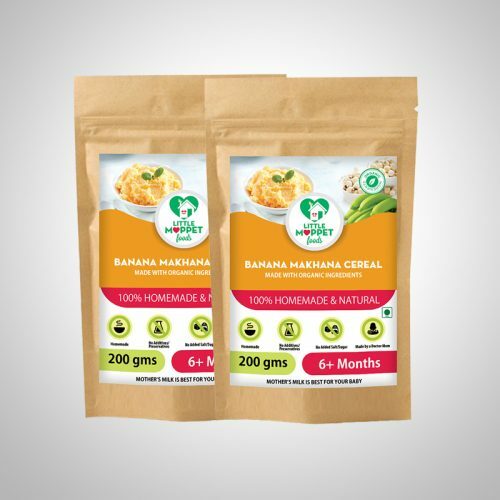 Including soya in your baby's diet is one of the best ways to ensure that she gets her daily requirement of protein. Besides being rich in protein, soya also has an abundance of folate, potassium, fibre and antioxidants. 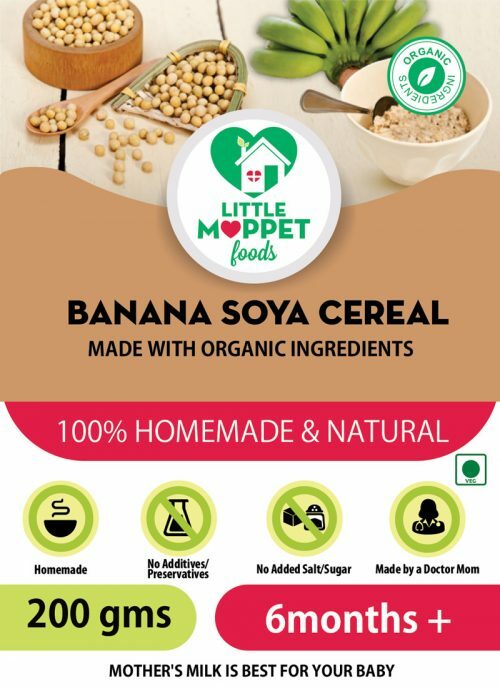 These benefits are compounded with the addition of raw Kerala banana powder in Little Moppet Food’s Banana Soya Cereal. 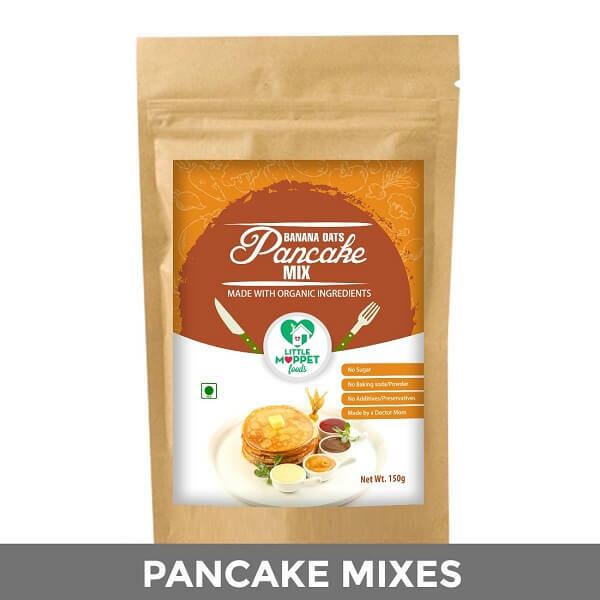 With the protein, fiber and other nutrients from soya along with good quality carbohydrates from Kerala bananas, you have a complete meal in one bowl! 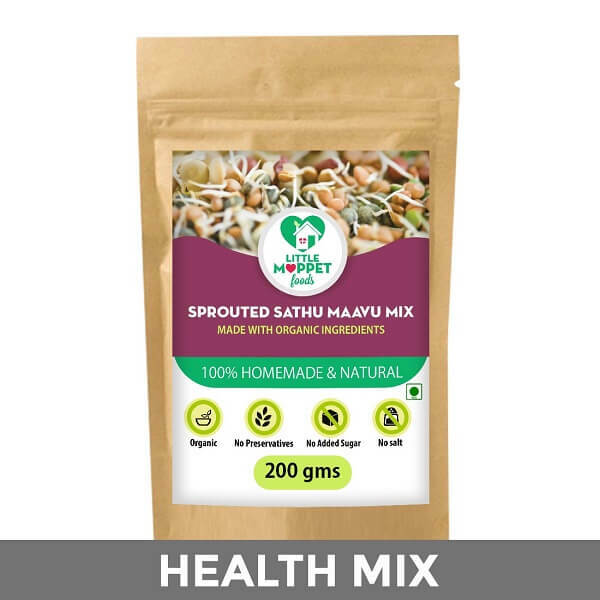 We've done the difficult part by drying and grinding the Kerala bananas ourselves and making the mix under the strictest hygiene conditions. 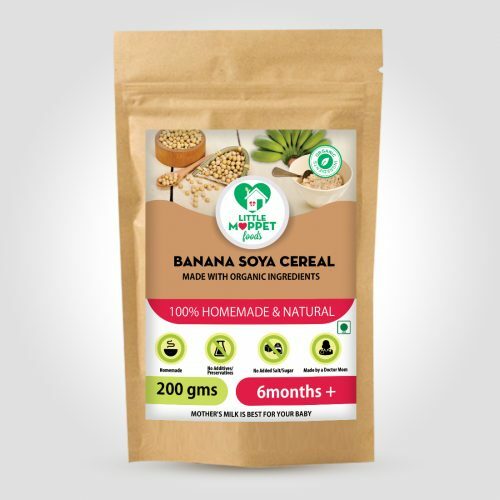 And you don't have to worry about elaborate cooking techniques with our Banana Soya Cereal - just stir into water, cook and serve! Feeding your baby a balanced meal was never this easy! 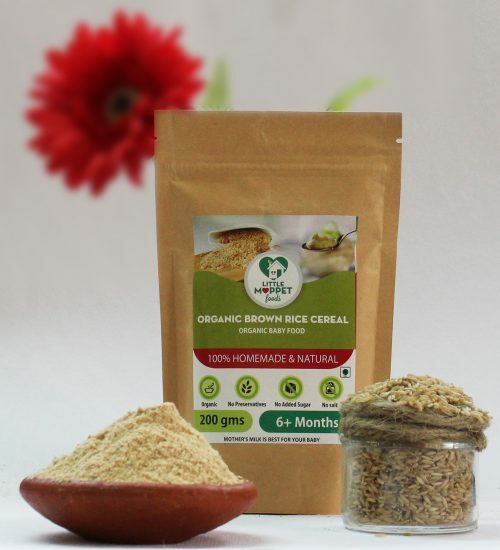 Rice cereal is among the most common first foods introduced to a weaning baby. One reason this is so is because rice cereal is relatively bland and does not strong flavors that may overwhelm babies. 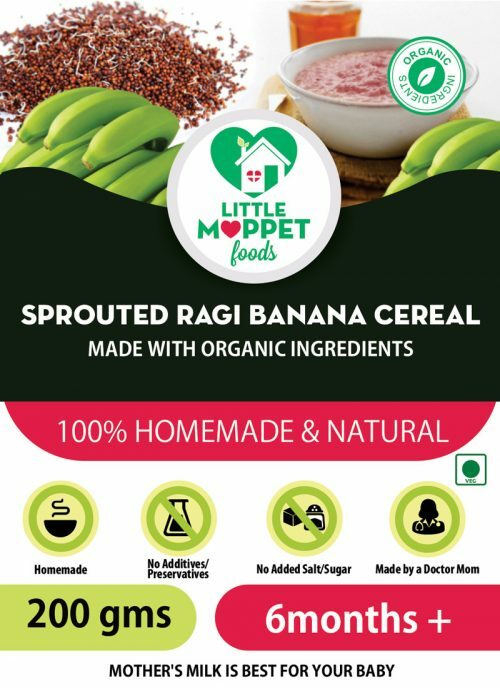 But when your baby is ready for more, then Little Moppet Foods’ Banana Rice Cereal is the perfect way to give her naturally sweetened cereal! Rice is a staple food in many Indian homes, which is one of the reasons it is very popular as a first food. It offers the perfect base for something like raw Kerala banana, which is rich in fiber and has high calorie content. 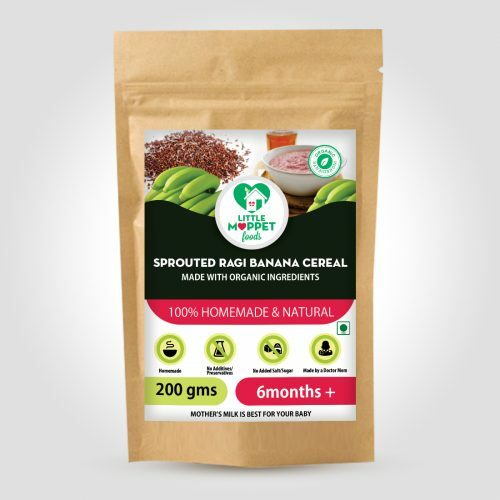 Raw Kerala Bananas make this cereal a rich source of potassium, folate, calcium, magnesium, iron as well as Vitamins A, C, K and B6. 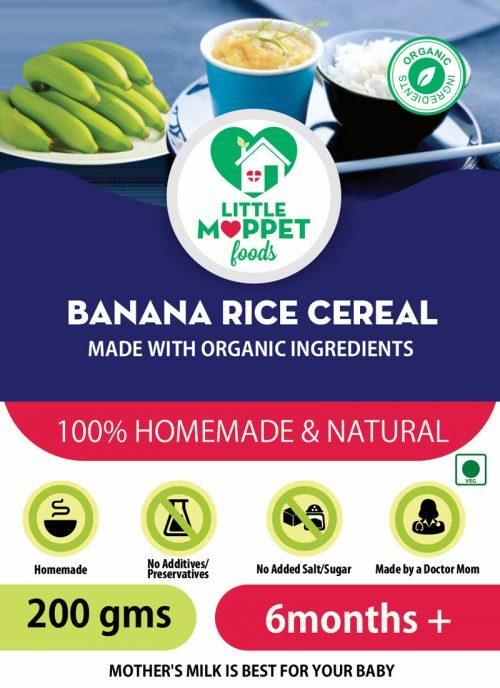 Little Moppet Foods’ Banana Rice Cereal acts as a natural progression from rice cereal, and helps in gradually getting baby accustomed to complex flavors. This is particularly important if your baby has shown any sign of wheat intolerance or if food allergies run in the family. 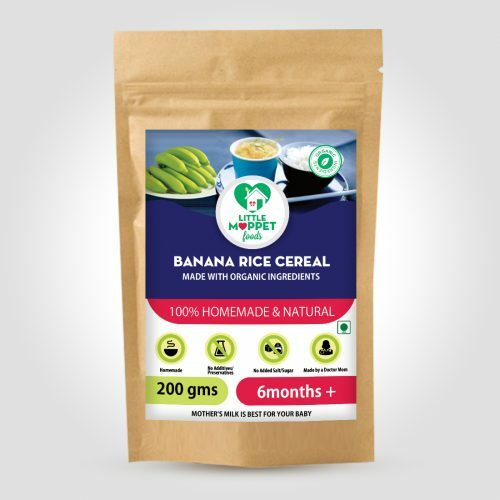 The only flavors in our banana rice cereal are naturally occurring ones from raw Kerala bananas and elaichi – there are no artificial flavors, preservatives or added sugar. 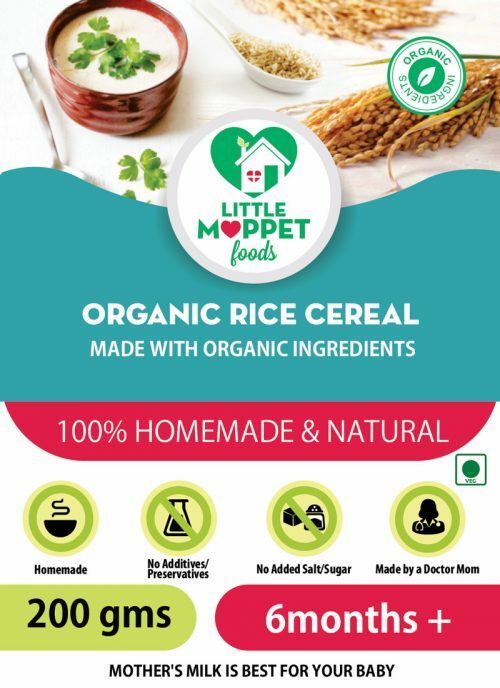 Nutritious Organic brown rice cereal for babies. 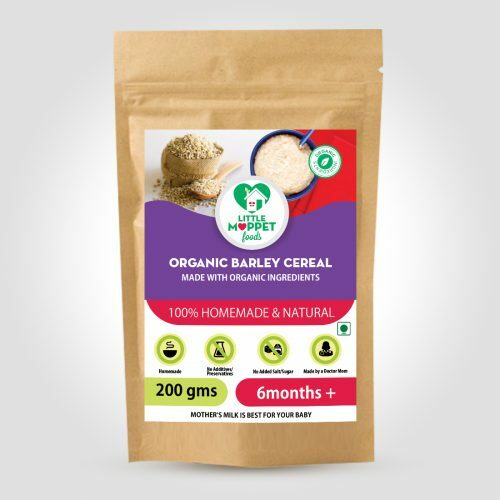 wholesome, strengthening and easily digestible first food for babies. 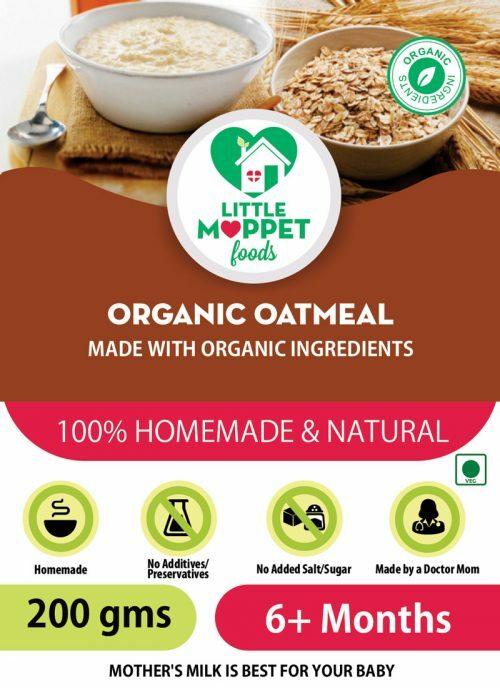 Nutritious, filling and easily digestible first food for babies.